If you want to trade volatility, you can place a bet on the option market. Just buy an at the money put and call, and at expiry day you will either win or lose, depending on the actual market move since you bought the straddle and the price you paid for the straddle. To put it simple, if the market moves more than you paid for the two options you will win, otherwise you will lose. This article is about a back test of volatility. When I look at the S&P500 I could buy or short a straddle with 16 business days until expiry right now for around 70$. That’s the implied volatility. When I look at the standard deviation of 16 day returns, using the last 30 days to calculate it, it shows me a volatility of around 30$. That’s historical volatility. Now I got three measures for volatility, but which one is the best prediction for future market volatility? And how big will the error (=wins and losses) be if we place this bet over and over again? Placing an perpetual bet on future volatility using the payback profile of a short straddle will give me an idea on how good historical volatility and Kahler’s volatility was able to predict future volatility. In a perfect world this virtual test strategy should be zero sum game; if not, future volatility is either over or underestimated by these 2 indicators. The chart above gives you an idea on how I did the backtest. I place a weekly bet on volatility, based on a short straddle trade. So if I close outside the of the projected volatility, I have a loss. If the market closes inside the projection, I win. The maximum win will be the price of the volatility indicator at the beginning of the bet, the max loss is the point move within the week minus the price I got for volatility at the beginning of the bet. Summing up the shown profits I generated a virtual equity line of a virtual straddle. 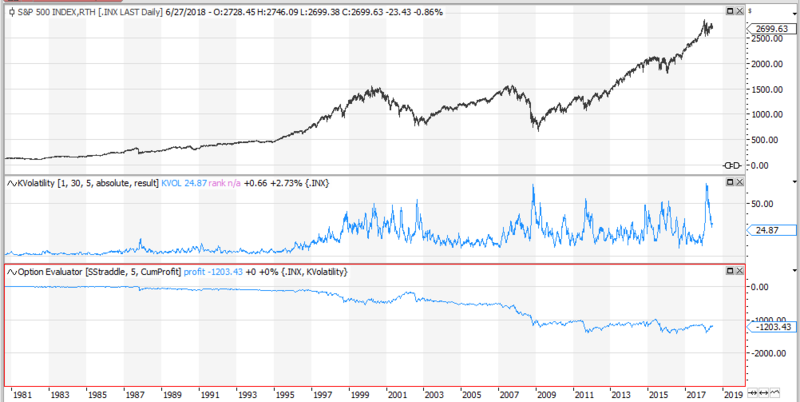 This gives an idea if historical volatility is a good predictor for future volatility. 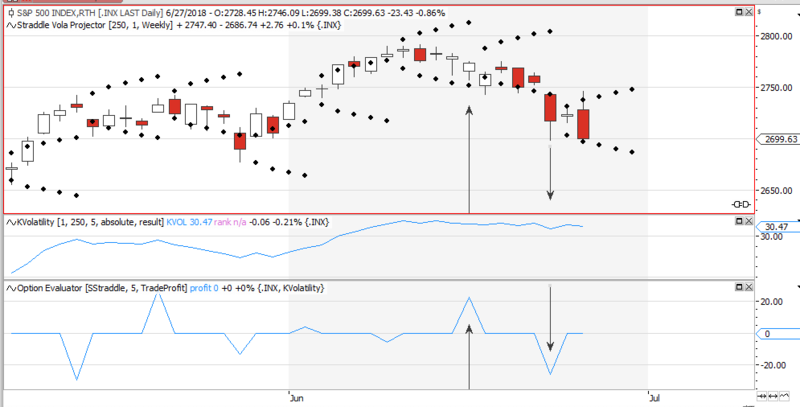 On the chart above you see a test, using the 30 day one standard deviation as the volatility predictor. As you can see volatility was overestimated by standard deviation, resulting in a 2688$ win over time. The average prediction of historical volatility for the next 5 days volatility has been about 2.6$ too high. If the same test is done using KVOL instead of historical volatility, the findings would be that KVOL has underestimated future volatility by 0.5$ per week. So it seems that, in the long run, KVOL is a more precise prediction of future volatility than standard deviation has been. Both simulations have been done using the last 30 bars of data to calculate KVOL and historical volatility. But one could also use the last 5 or 250 bars of data. Let’s see how this would influence the quality of the prediction. The table below compares the weekly prediction error for kvol and historical volatility, depending on the number of data points used to calculate the prediction. Implied volatility, buy or sell? 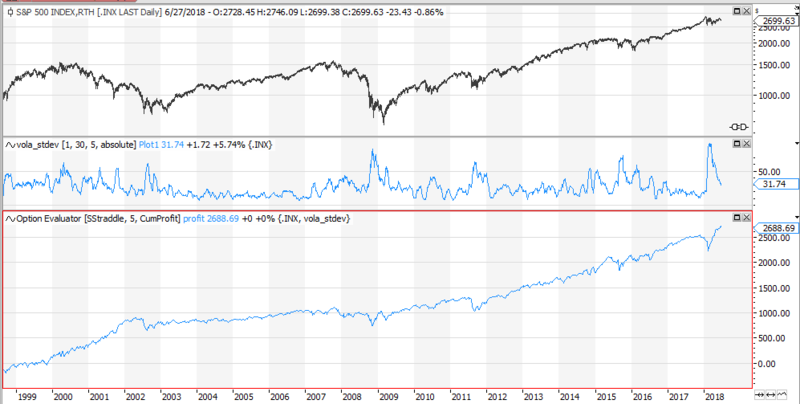 I started this article when the price for a SPX straddle was around 70, hist-vol around 30 and kvol around 50. Given the above findings, implied volatility right now is way too high. Traders are willing to pay more for volatility than the fair price, suggested by historic returns, would be. So I would suggest it is time to sell a straddle and not to buy one. But this is just today’s analysis, last week i have been bullish on volatility, as you could get a straddle for less than kvol would have suggested.
! Be aware of the unlimited loss potential of a short straddle. You could be wiped out tomorrow, regardless what past statistics suggest. This very unpopular risk reward profile is another cause for implied volatility being higher than historical volatility..